In order to have light, fresh dessert after all the pastry and cream, I decided to try and make a sorbet and like a lamb to the slaughter, I raided The Complete Book of Desserts (Ann Seranne, 1954) again. I’ve had my eye on this for a while – it looks foolproof, yes? Here begins a week (or probably a bit longer, seeing as we made loads of things) of posts from our Eurovision party. After the simplicity of the butter cakes, I swung in the opposite direction with some biscuits where the quantities of spice listed were borderline worrying – how much clove?! This is another recipe I have been really keen to try for some time. I decided to make a meringue shell, as opposed to a pastry case, as I really need the meringue practise. I followed a basic meringue formula – 2oz castor sugar per 1 egg white plus a pinch of cream of tartar, using 3 egg whites and flavouring it with a pinch of cinnamon and a few drops of vanilla extract. The meringue shell was not quite as I had planned: I think I over- or under-whipped the whites, I may have mis-weighed the sugar and the oven was too hot. I’ll do a proper post on meringue in the future, paying more attention to meringue science, on which I have copious information, which on this occasion, I chose to skim-read and then ignore. 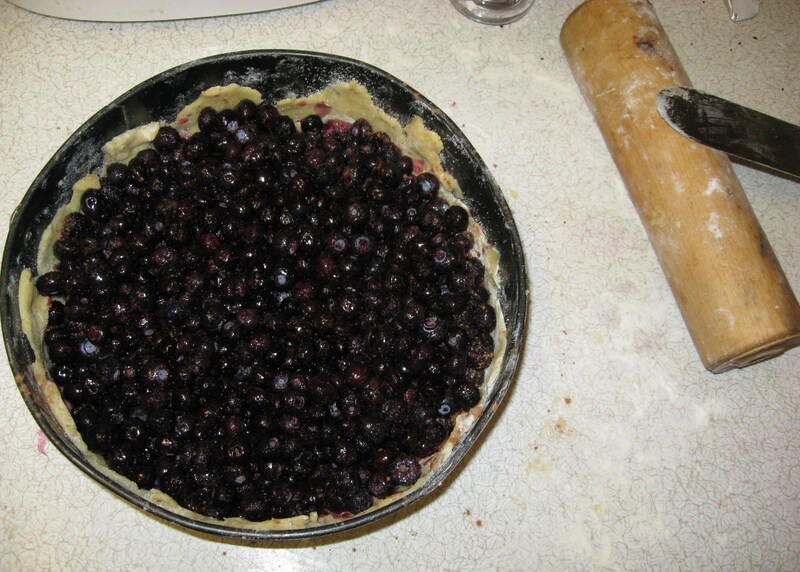 Piemonth continued in the 3rd week of Feb, (week 2 was cancelled so I could have swine flu/glandular fever/some other rottenness) with the US classic blueberry pie! (Ok, tart.) I have always had quite a low opinion of blueberries au nature – I find them a bit limited and sickly flavour-wise, but this recipe seemed to counter-balance that with the addition of other seasoning. I decided to attempt a new kind of pastry (to me) also, tart paste, translated from pate a foncer which means lining dough and is apparently the classic French pie dough. (I wouldn’t know, I mostly stick to les gateaux or les mousses in France.) Both of these are taken from Ann Seranne’s The Complete Book of Desserts. I made the pastry the day before and stored it in the fridge overnight. 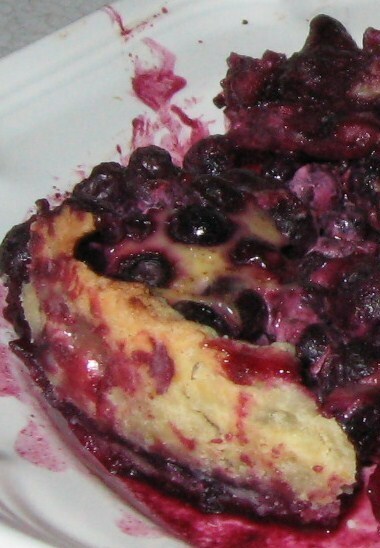 A quart of blueberries, for our UK/European readers, is about a litre, which was about 900g of blueberries. It was very obvious when I was rolling out the pastry that a 9 inch diameter dish was too big. I used a spring-sided cake tin as I only own a small, shallow pie dish. 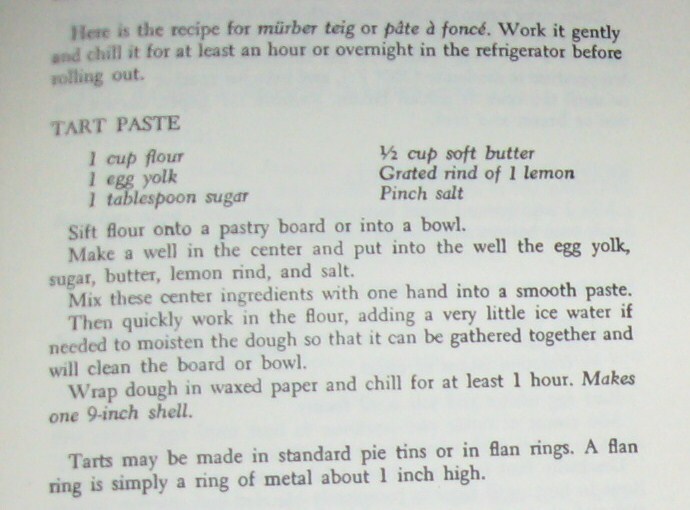 The recipe specifies to ‘butter’ but not flour the tin. I was suspicious of this but followed the recipe to the letter. If you’ve never had a drop biscuit, imagine a rock cake, without the rockiness. As these went so well, I decided to try another variation, this time from The Complete Book of Desserts by Ann Seranne (1952, Faber and Faber for the Cookery Book Club) which has recipe for several kinds, including chocolate, almond and molasses (which is definitely on my list). This section of the ‘Small cakes and cookies’ chapter is called ‘Some Old Cooky Jar Favorites’.